Flamingo Nap is a piece that just happened while I was playing with my paints about a week ago. My daughter and my best friend came to visit a few weeks back and we visited the Brevard County Zoo. 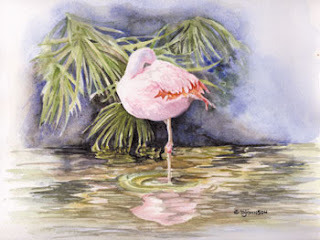 They have some beautiful flamingos there and I took several photos of them napping at the edge of a pond. As I was going through my photos, this one captured my eye and I started sketching with my watercolor pencils. After drawing the initial bird and some reflections with the watercolor pencils, I got out my palette and played with it some more. I am in the process of framing it, so it should be at one of my upcoming shows or at the Art and Antiques Gallery soon.